Back in September, I bought a simple navy dress on sale while on a work trip to New York. It’s the perfect dress. It doesn’t wrinkle, can be dressed up or down, worn with tights or bare legs, with sandals or boots, belted or loose, plus, it’s my favorite color. Perhaps it goes without saying that I’ve worn it so often, my girls refer to it as “the dress”, as in, are you wearing “the dress” AGAIN? Some things are just like that. Worth repeating. 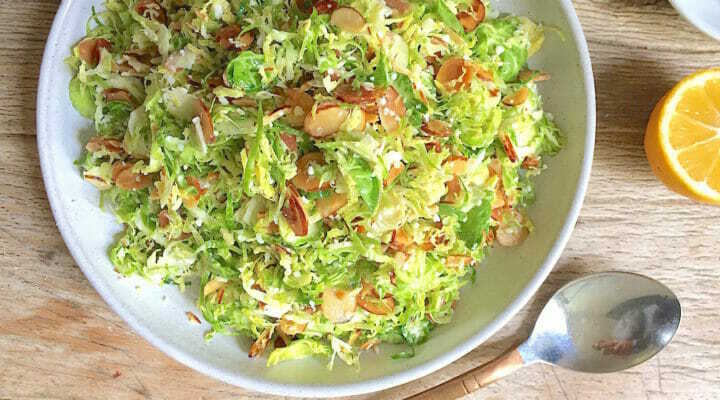 And this Shaved Brussels Sprouts Salad has other very good reasons to be repeated. Brussels sprouts, like their brassica brethren (think cauliflower, kale, broccoli, cabbage, and collard greens) are astonishingly good for you. Indeed, they are one of the most nutrient dense foods you can eat. One cup exceeds your daily needs for vitamin C and vitamin K (good for bones), with a whole cocktail of phytochemicals and antioxidants linked to minimizing risk for diabetes, heart disease, and cancer, all at just 38 little calories. The fact that the Brussels in this salad are served raw rather than cooked may have its upsides too, since some of its cancer-fighting compounds (along with certain vitamins) lose their potency when heated. One tip: you can do the work of shaving Brussels sprouts in a matter of seconds using the slicer blade of a food processor. If you have a Japanese mandolin, that will do the trick as well. Now, if you don’t mind, I’m off to make another batch of “the salad”, probably while wearing “the dress” as well. The work of shaving Brussels sprouts can be done in seconds by using the slicer blade of a food processor. Alternatively, a Japanese mandolin will do the trick. This salad is excellent the minute it's made, and just as good the next day. Preheat oven or toaster oven to 350 degrees F. Spread the almonds on a baking sheet and bake until golden brown, about 8 minutes. Remove from heat and let cool. Trim off a thin slice from the bottom of the Brussels sprouts and wash well. Use the slicer blade of a food processor to shave the Brussels sprouts. Alternatively, use a Japanese mandolin to slice them very thin. Put the Brussels sprouts, almonds, Pecorino Romano, lemon juice, olive oil and salt into a large bowl and toss well. Serve. This post includes some affiliate links. Mom’s Kitchen Handbook earns a tiny percentage from purchases made from these links. 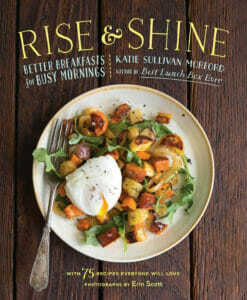 This looks divine Katie! I’ve made a similar salad with my latest favorite obsession-Meyer Lemon White Balsamic Vinegar-yum! I have to say I REALLY want to see what THAT dress looks like now 🙂 I love navy blue too! Two thumbs up! We made this tonight for a guest who had THIRDS! We saved half (and set aside the dressing to add later), so we could extend this over several meals as it is a generous portion. Thanks, Katie! Oh good! Thirds is about the best compliment I can get. Thanks for taking the time to pass that on. I appreciate the feedback! Will th sprouts turn brown if I shred the night before. They should be fine overnight. Love it! Made this a few times for guests and have had many requests for the recipe. Oh good! I am crazy about this salad (just ask my kids 🙂 Glad you like it too! This salad is amazing! We cooked it for Fourth of July and my family loved it! Success! I’m crazy about this salad too. So glad you enjoyed it. Should I dress the salad immediately after mixing to eat at a picnic later, or dressing it right before eating? Either way would work. If I had my preference, it would probably be shortly before serving. Looking forward to trying this. How many servings does it make? I’ll be feeding a crowd of 20+. It serves 6. For a crowd of 20, it sort of depends on whether or not you’ll have a lot of other dishes/sides. I’d probably triple it, knowing if you have leftovers, they will keep for a day or two. Hope that helps. Katie. This salad is fabulous. Thank you so much. I tossed in a handful of dried cranberries for some seasonal color and a little sweetness. I love your “the dress” story. I am the same way!!! Yummy! I added a teaspoon of Dijon mustard to help with emulsification, and additional olive oil and black pepper. I also used walnut instead of almonds. Those both sound like terrific variations on the recipe. I live in FL and cook a lot of fish. I love this salad and so does my BF and a lot of our friends. It goes perfectly with a nice grilled or pan fried fish. To me it really does need the addition of dried cranberries or cherries to balance the lemon. One of my absolute favorite salads. Awesome…and I love the idea of adding tart dried fruits to this. Thanks for the comment! Can we see what the blue dress looks like so we can look for it?? Can’t wait to make this salad today! Perfect! Hope you like it. I love this salad! I ate it three days in a row last week, then made it again this week!!! Yay! I love this one too…it’s nice that it holds for a few days, too.